Finally, the much awaited imaging-focused Nokia Lumia 925 was launched in the Philippines last Thursday, August 1, the Windows-based smartphone is armed with Nokia’s signature polycarbonate body encased in stylish aluminium, measuring just 8.5mm and weighing 139 grams. The screen 4.5-inch is made of Amoled, Gorilla glass, with ClearBlack technology and Sunlight Readability promises clear and bright images and text. Boasting, its 8.7MP camera, with Zeiss optics which now has 6 physical lenses for higher level precision, delivers sharp and vivid images even in low-light conditions. It allows to capture up to 10 images at once with Nokia Smart Camera, so users can edit the images taken with options like Cinemagraph, Action Shot, and Change Faces. The unit’s Maps and Livesight allows the user to explore the world around in augmented reality. A snap-on cover also turns the Nokia Lumia 925 into a wireless-charging enabled device, so users can pair it with a Nokia wireless charging stand or plate. Its Pure Motion HD+ technology with Optical Image Stabilization also lets users take smooth, blur-free videos even when there is motion. The Nokia Lumia 925 will be retailing for P23,500 at Nokia Stores and at Nokia Solutions Partners. It will also be exclusively available to Smart subscribers, and will come free when bundled with the Smart Unlimited Data Plan 1500, with a 30-month lock-in period. 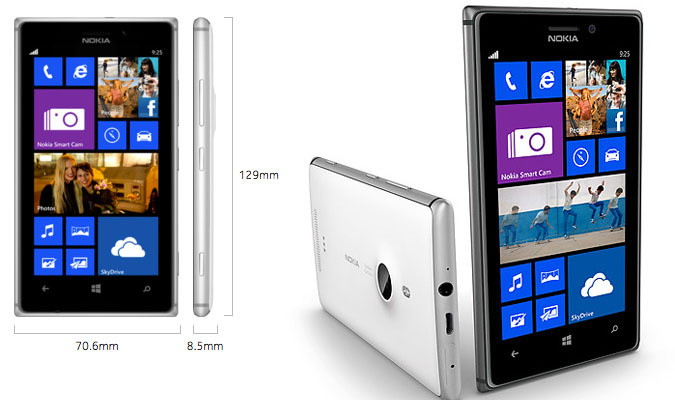 The Nokia Lumia 925 will be available in white, grey and black — starting August 19.